The awards were presented at the B.C. Transportation Conference in Vancouver on Tuesday, Jan. 30, 2018, at the Deputy Minister’s Consulting Engineers Awards ceremony. Project designs are complex and must consider many different structural, geotechnical, social and environmental variables. The Consulting Engineers Awards recognize technical excellence in the categories of: Design and Contract Preparation – Roads; Design and Contract Preparation – Structures; Construction Management and Supervision Services; Specialized Engineering Services; and Alternate Transportation. SNC-Lavalin won this category for its work on Highway 97 North in Quesnel. SNC-Lavalin designed a 2.7-kilometre four-lane upgrade to the highway, between Dragon Lake Road and Quartz Road. Despite being confined by Agricultural Land Reserves on both sides of the highway, SNC-Lavalin completed the project with minimal impact to the environment and improved safety and mobility along this corridor for the travelling public. WSP Canada Inc. won this category for its work on the Upper Cambie Creek Bridge replacement on Highway 3, near Allison Pass. The project design included wider traffic lanes, bike-friendly shoulders and modern traffic barriers, as well as enhancements to the wetlands next to the construction site. WSP Canada Inc. faced a tight schedule due to the construction window being limited to a few summer months, but the project was delivered on time and on budget. 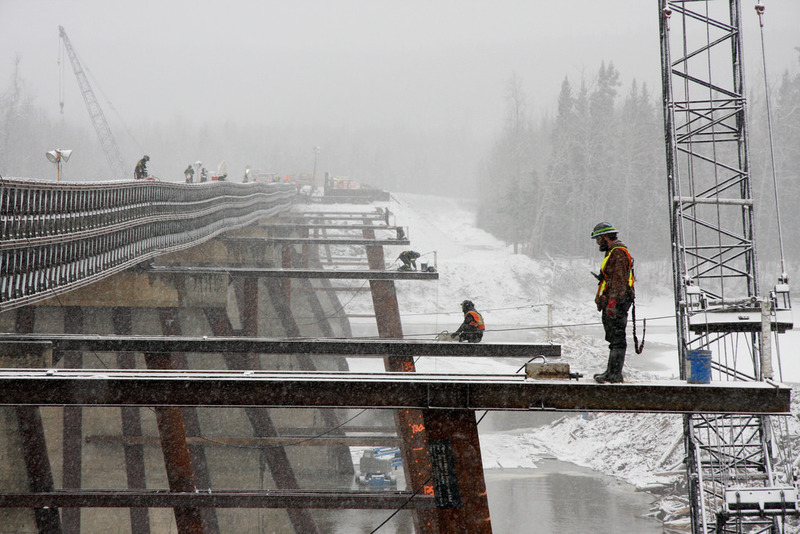 Binnie Construction Services Ltd. received this award for its work on the Fort Nelson River Bridge replacement. The project included sliding the existing bridge over for the traffic detour, building ice bridges on the river for winter construction access, and construction and installation of the new bridge. The remote location, a short construction season, difficult weather and changes to the design scope posed challenges, however the project was still completed within budget. Wyssen Avalanche Control Inc. won this award for its design, fabrication and installation of nine remote avalanche-control systems at key locations along the Trans-Canada Highway, near Revelstoke. The system allows technicians to monitor conditions remotely on a 24-hour basis, improves safety and reduces the length of road closures due to avalanche control. Despite difficult weather and terrain, the project was completed on time and on budget. Urban Systems took home this award for its improvements to the Cultus Lakeside Trail, south of Chilliwack. Urban Systems worked closely with the Fraser Valley Regional District, BC Parks, the Lakeside Trail Society and the ministry to provide a designated corridor for pedestrians and cyclists, separate from traffic. Extensive consultations were done to ensure the new design incorporated feedback from all stakeholders, resulting in a better multi-use trail for the public to enjoy.